Welcome to Saragna. Please enter your details to login. Please fill in all required fields to register. Disclaimer: We sell only brand new and 100% genuine products. Every effort has been made to ensure that the information on this site is accurate. 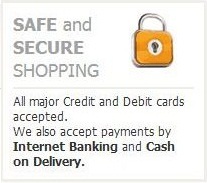 Saragna offers an option to pay Cash on Delivery (CoD) for your orders. Your delivery address should be under serviceable network of our courier partners. Please enter the correct PIN Code to ensure delivery. Please pay in cash only and do NOT offer cheque or DD to the courier staff. Please do NOT pay for any additional charges, i.e. octroi etc. to courier staff. Your invoice amount is inclusive of all charges. We strive to deliver products purchased from Saragna in excellent condition and in the fastest time possible. For all purchases of Rs. 500 or more, we will deliver the order to your doorstep free of cost. A shipping charge of Rs. 35 will be applicable to all orders under Rs. 500. If the order is cancelled, lost or un-delivered to your preferred location, we will refund the complete order amount including shipping charges. If you return an order delivered to you, original shipping charges will not be refunded. However if you self-ship your returns, you will be reimbursed based on Saragna. Read our Shipping & Delivery FAQs to know more. All products sold on Saragna are covered by our 15 Day Returns Policy. In case you have any issues with product quality or sizing, you can return your product within 15 days of the date of delivery. On successful processing of returned item(s), you will be refunded the price you paid for the item into your Saragna Cashback account. This can be utilized on any of your subsequent purchases at Saragna. Read our Returns Policy and FAQs to know more. Only an option to Pay Cash on Delivery. Saragna.com is a destination for online shopping Women cloth in India. 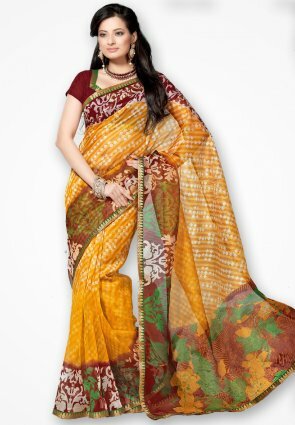 Some of the top selling brands on Saragna are Party wear,Designer,Cotton,Chiffon,Silk,Georgette,Printed,Embroidered,Net,Velvet Saree and Dress Material you can shop online or pay using Debit card,Credit card, Cash on Delivery, PAYBACK points to get products delivered across 2,000+ cities and 8,000+ pincodes across India.